GULFSIDE RENTAL. Updated and tastefully decorated 2 bedroom / 2.5 bath condo with spectacular views, looking out over the gulf of mexico, swimming pool and beautiful landscaped grounds. 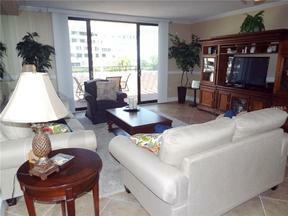 Enjoy views from the spacious and private balcony, living and dining room or the master bedroom. Features two spacious bedrooms both with an en suite bathroom as well as a half bathroom for guests. The open living and dining area is airy and bright perfect for entertaining. Private beach is just steps away. This lovely community includes 4 tennis courts, salt water pool and spa, fitness center, outdoor grilling area and gated access. Located just minutes away from St Armand's circle where you have plenty of choices for restaurants and shopping.